The Austin-based journalist Michael Andor Brodeur recently wrote about devices designed to locate missing items, such as car keys and cellphones. Among companies active in this field is Tile, a device that will search for missing items within a 100-feet radius “and play a loud tune until you find it.” One of Tile’s competitors, The O, appears to be a bit more upscale, making its sensor-fobs look like jewelry. The cost for a starter kit is $139. I imagine that for certain people, The O, Tile, and similar products would be helpful, maybe essential. And, yes, from time to time I do have to call my cellphone on my landline to discover where in my house I left it. Usually I hear it faintly beeping from inside the pocket of the jacket I last wore. But for people dealing with early-stage Alzheimer’s, as well as those who are just chronically absent-minded, there is a simpler way, at no real cost, to cut down on the time spent looking for things. Last year at this time, I was working with Dr. Laura Phillips, a neuropsychologist at Mount Auburn Hospital in Cambridge. I met Dr. Phillips in March 2014, about four months after another doctor at the hospital had intimated that I might be experiencing the symptoms of dementia. When my diagnosis was confirmed more than a year later, I was assigned to work with Dr. Phillips, as a means of mitigating the symptoms. One of the first things Dr. Phillips suggested was to purchase a notebook, the kind that is bound like a book, along with a weekly planner. The blank book, what I call the “purple book,” has been particularly helpful. Unlike with my weekly planner, the purple book rarely leaves our home. Occasionally I use it for brief journal entries, but the more important role is to serve as a reference for hints for various passwords—especially for those long strings of characters that Verizon requires when we’re having problems with our Internet service. 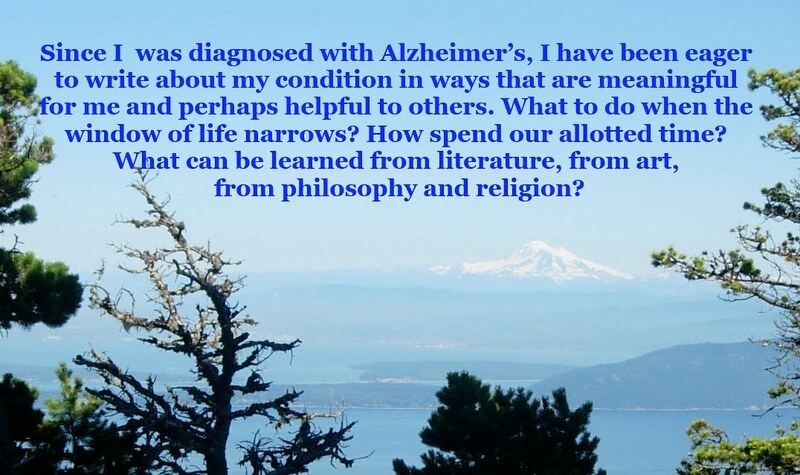 The book also serves as a place to enter contact information for people I’ve met from the Alzheimer’s Association or on the state panel I serve on that focuses on providing services for people with Alzheimer’s. Each object that I use daily—wallet, keys, cellphone, reading glasses—has a designated place. My wristwatch, for example, hangs on a hook near our sink, so there will be no chance of my plunging the watch into the dishwater. Do I still misplace things? Yes, often. But not as often as I did when I first starting experiencing the symptoms of dementia. The one object that I most misplace is my favorite pair of reading glasses. If I did an inventory, I would probably find more than half-a-dozen other pairs, some of which I should have already discarded, because they no longer meet my needs. Dr. Phillips also advised me to limit clutter in our home, and, while the results were modest, they were steps in the right direction. For the first time in a couple of years, I had tidied up our narrow, walk-in-a-crouch attic space. The effect was short-lived. Roughly six weeks into the new year—Valentine’s Day’s, to be precise—a pipe burst due to the cold, and, a moment later, I beheld a fishbowl-shaped light fixture in our front hallway filling up with water. The only thing missing from the scene was a goldfish or two floating belly-up, after dying from the shock. The good news was that nothing caught on fire. The bad news was overwhelming: All the boots, shoes, coats, and books in our front hallway and all the books, photos, files, office supplies, and other items in the home office had to be stored somewhere else while repairs were made over the next month. The result was a packed attic crawlspace, a packed front enclosed porch, a coat tree and desks moved into the living room, and important papers stored in the dining room. Not exactly what Dr. Phillips had prescribed. A means to slow Alzheimer's? This past Sunday, the Boston Globe ran a lengthy article devoted to an Eli Lilly drug candidate designed to slow—not cure—Alzheimer’s disease. The article, produced by the news organization STAT, stated that while the drug failed to slow mental and physical deterioration among people with mild-to-moderate Alzheimer’s, the news was not all bad. As the author of the piece, Damian Garde, noted, “a secondary analysis of pooled data in patients with mild forms of the disease” showed a 34 percent reduction in the patients’ cognitive decline. This finding could be significant. While some people with Alzheimer’s deteriorate rapidly, the much more common scenario is a long, gradual decline—so mild that in the earliest stage of the disease, neither doctors nor patients are likely to be aware that the person has the disease. This is especially true for people with early-onset Alzheimer’s, because they aren’t at an age when the disease is expected to occur, and symptoms are mistaken for other problems, such as attention deficit disorder. In my case, it took about three years from my first symptoms to my diagnosis. Like most people in my situation, I felt that I had been given a death sentence. And I had. But the executioner has turned out to be a lazy fellow, and four-and-one-half years later, my symptoms remain mild. But there is a possibility that Eli Lilly’s drug candidate, solanezumab, could add many additional years to the arc of Alzheimer’s progression. At the far end of optimism is the notion that Alzheimer’s could become a manageable disease, as AIDS did in the early 1990s, thanks to a complex cocktail of drugs. According to Garde, people treated with solanezumab performed about 35 percent better on cognitive tests than those on a placebo. In tandem with common-sense measures such as exercising regularly, following a reasonable diet and getting plenty of sleep, solanezumab could extend life expectancy significantly in the face of Alzheimer’s, according to Garde. But as he noted, roughly 99 percent of all Alzheimer’s treatments have failed. A particularly blunt statement came from Mayo Clinic neurologist David Knopman: “I hate having to tell people that we don’t have anything that can truly arrest the disease at this point.” The rather modest aim, according to Garde, is to see if the drug does better than the placebo. The plan is to inject the subjects, all of whom are at a relatively mild stage of Alzheimer’s, once a month with a drug that has the potential to clear away amyloid plaque, a dominant feature of the disease. As the Alzheimer’s researcher Dr. Howard Fillit commented in Garde’s article, the best-case scenario would be that solanezumab would serve as a foundation for further Alzheimer’s research. That, Fillit said, would likely create the biggest market for any pharmaceutical ever. Under optimal circumstances, the drug could be approved by late next year. That strikes me as a long shot. Still, solanezumab is welcome news. Paula and I recently attended a dinner party where everyone either had a spouse with Alzheimer’s or had been diagnosed with the disease itself. All of the diagnosed individuals happened to be men, and all but one of us reported suffering a concussion as a child. Mine came when I was around six, riding on the back fender of my brother’s bike. When I came to, I was lying in the back seat of our car, not long before we reached our doctor’s office, a trip of about fifteen minutes. It is clear that I had fallen backwards. My brother, who was four years older, recalls seeing an egg-shaped lump protruding from the back of my head. He raced down our hill to alert our mom. This was long before kids wore bike helmets. Could that single childhood concussion have predisposed me to develop Alzheimer’s in middle age? From an early age I liked to play rough games—wrestling with my brother on our carpet, not far from our brick mantel, or playing tackle football in our backyard, without helmets, often with bigger boys. The playgrounds at our elementary school were entirely paved, which ruled out playing tackle football—unless snow was on the ground. In one of the years when we did get substantial snow, I banged heads with a friend of mine. I didn’t exactly feel the pain but I smelled it—an odor of rubbing alcohol, or something else one might encounter in a hospital. In sixth grade, I played my first of seven seasons of organized football. An article published in 2011, “Long Term Consequences: Effects on Normal Development Profile after Concussion,” notes that “immature neural tissue differs from mature tissue in reponse to injury.” The key word is “plasticity.” A young brain, in other words, is more vulnerable to damage than an adult brain is. In one sense, I feel fortunate. Whatever damage I suffered from that long-ago head injury, it had little effect on me as I was growing up. I generally did well in school, though in math I got no further than geometry, a subject that I struggled with. It’s possible that my childhood bicycle accident did enough harm to damage my spatial reasoning. My sense of direction has never been good, and these days it is atrocious. But according to the study I cited, many childhood head injuries come with much more damaging consequences. “Because the prefrontal cortex is one of the last brain structures to mature, it is not surprising that parents [often] report attention deficits, hyperactivity or conduct disorder,” following a concussion, according to the study. That my head hit on the back of the skull, rather than a more sensitive part of the brain, may have spared me from worse damage. My consequences, to the extent that I can document them, were a good deal more subtle. I was a high-spirited child, but I did well in school. Yet I do believe that my concussion roughly 50 years ago is at least partly responsible for my short-term memory and executive-function difficulties today. Throw in the countless helmet hits I endured in my seven years of organized football, and there should be little mystery about why I began to experience mild symptoms of Alzheimer’s a few months before my 51st birthday. Unlike Walden Pond, where Henry David Thoreau lived for more than two years, Lake Padden isn’t famous. Most people outside of northwest Washington are unaware of it, and that is for the better. As a child and a teenager, I spent more time at Lake Whatcom, the deep, cold, ten-mile-long body of water where I shivered through fruitless swimming lessons and, more than a decade later, learned to water ski. On Lake Padden, motorboats are not allowed. In high school, my friends and I would float on the lake in inner tubes, sometimes with a six-pack attached a few feet below the surface, keeping the beer exceedingly cold. In August, as the football season approached, I would often run two laps around the lake, a distance of just over five miles. It wasn’t until my junior year in college that I fully appreciated Lake Padden. I’d been having a rough time on our college newspaper, which I’d worked on since the spring of my freshman year. No one questioned my competence as a reporter or an editor, but I was an aloof manager, assuming that the people I was supervising would work as hard as I would. In the fall quarter, when I was a junior, the editor of the newspaper was diagnosed with mononucleosis, and I temporarily filled his place. I thought I was leading by example, but what I was really doing was alienating the majority of my staff. One evening I walked into the newsroom, and I sensed that people had been gossiping about me. The chatter stopped as soon as I appeared. On the day before the new editor would be chosen, I walked around Lake Padden. It was in early March, a damp part of the year. No one else could be seen. The oxygen I was drawing in acted like a sedative. In the solitude of the muddy trail, I realized, for the first time, that I might not be appointed editor. I had no idea of how to respond. It didn’t occur to me that I should have called a staff meeting, with the aim to clear the air. College is a place where, to one extent or another, most students are not fully mature. I certainly wasn’t, and it showed. But the walk around the lake enabled me to perceive the truth: There was a good chance that I would not be chosen as the next editor—a truth confirmed the following evening. 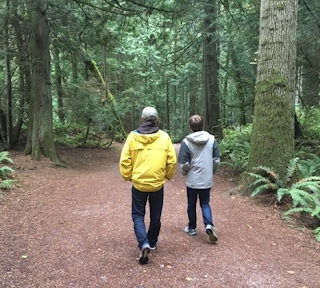 Nowadays, a walk around Lake Padden’s mild terrain is an essential part of my annual visit to my home town. Walking with me last month were my son Andryc and my cousin Jackie. During the week-plus that we spent in the area, there was only one day with any rain, and I would have felt cheated by drought if we missed out on what the author Timothy Egan coined “the good rain”: the mossy cedars, the stately Douglas firs, the lush carpet of needles on the forest floor. Other than the occasional plop of horse poop, this is the most peaceful place I know.